Okay. I'll be honest here; I've never played Kingdom Hearts. Like, at all. But I knew by proxy that the music was something to experience, so when I got the press release for the new EP "Heroes of Light" I figured "Hey, why not? I'll give it a listen, write a blurb, and it'll be a cool few minutes. Might look into the game." Let me tell you, I'm having a severe emotional reaction to a franchise that I've never touched—never even watched a video of—just because of this music. This new EP was just released by Materia Collective as a celebration of 15 years of Kingdom Hearts, and is a musical retelling of the stories of four of their most beloved characters: Sora, Kairi, Roxas, and Riku. You'll have to bear with me, because I'm not familiar with these characters (which I'm severely regretting right about now), but the four tracks are as follows. The first track is Sora's theme, "There's A Light That Never Goes Out." It's a piano duet, with the two plucky players interacting and harmonizing in what I could only describe as friendship—and then I read the press release, which describes this track as intending to "highlight the camaraderie he shares on his journey," so I'd say that's pretty darn spot on. The gradual crescendo throughout the song with both volume and complexity is definitely indicative of a journey. The third track is titled "Inside Us" and it's the one that, for me, stands out from the rest, not necessarily because of quality but simply because of composition. It begins with dissonance (and what sounds like a soundtrack being played in reverse) with an abrupt stop and then, quickly, sorrowful piano. As the song proceeds, violin chimes in along with more aggressive sad piano (because this dude wasn't struggling enough) but the electronic elements return throughout the composition, "[pulling] away at the essence of him and his theme" according to the PR. Finally, the fourth track is Riku's, entitled "I'm Not Afraid Of The Darkness." I had the strongest reaction to this one by far (likely because it sounded like something from The Legend of Korra at first, but I digress). This guy seems like he's on the same struggle bus as Roxas, but in a more sorrowful sense, with deeper tones and an even meter that draw out emotions from deep within you. Homeboy is definitely going through some stuff (and I would know what, if I played the games, but even though I haven't I can tell you with absolute certainty that yes, in fact, homeboy is going through some stuff). So, short version of all of this? The common thread? Composer Peter de Vroom is a frickin' genius. He began his music career after being inspired by the Final Fantasy VII soundtrack, and developed a particular love for video game music. He states on the Kingdom Hearts franchise that it "has the ability to create truly magical and emotional moments" and he's replicated this excellently in this EP. Even I can tell that. 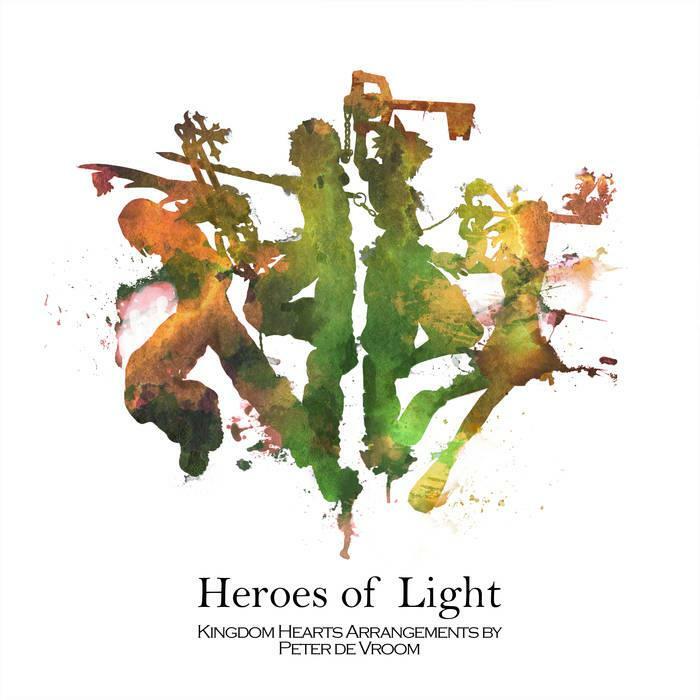 "Heroes of Light" is available now on Spotify and Bandcamp, and i can't stress enough that it's worth the few bucks to purchase if you're interested. You'll love it if you're already a fan of the series, and if you're a newcomer like me? Well, you might just find something new to love.